Thrive Turkey Dices are great in pitas or lettuce wraps. Try them in a homemade turkey pot pie for the ultimate in comfort food. 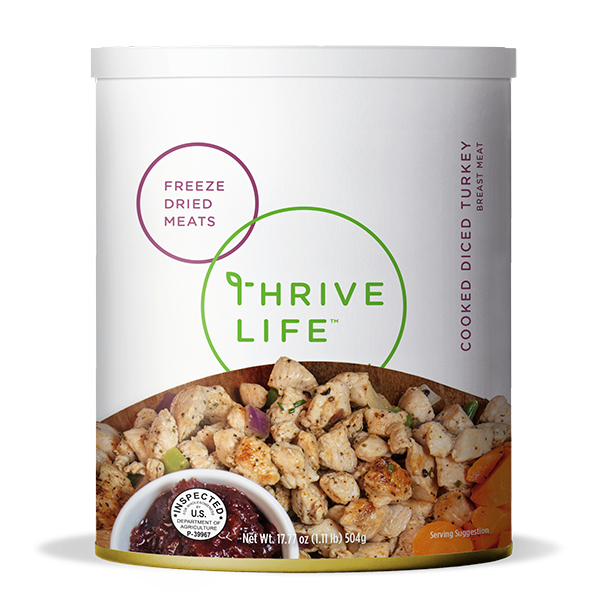 As with all Thrive freeze dried meats, our Diced Turkey is pre-cooked and will be ready for eating once rehydrated. Add 1/3 cup warm water to 1 cup Turkey Dices; cover and let sit for 10-15 minutes, or until tender. Use them in pastas, casseroles, soups, and pot pies. Help your kids make their own "cup of noodles" by putting dry noodles in a mug and letting them add turkey dices and their favorite THRIVE veggies!